Supercars are great. They are big, exotic, noisy, expensive and fast but everything that makes a supercar special can also make it a complete nightmare to live with. 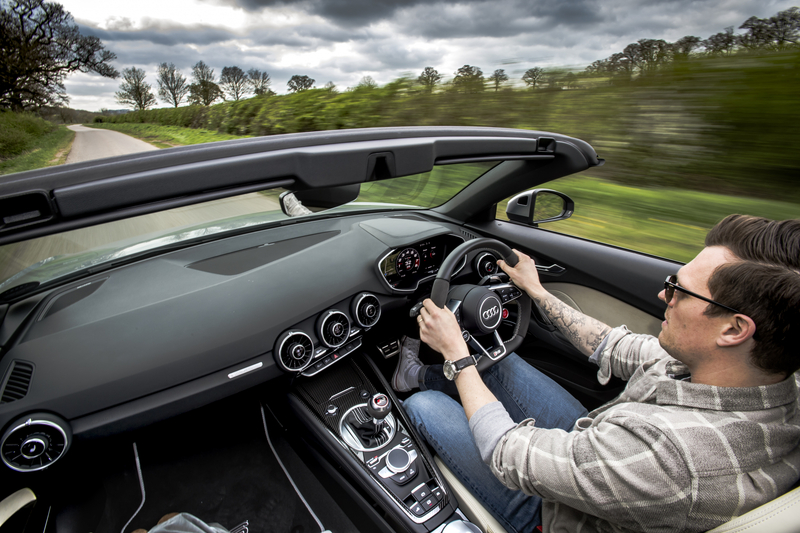 Even the Audi R8, which is often considered one of the friendliest performance machines to own, can prove difficult when it comes to going about your mundane business. High kerbs are evil, concrete width restrictions are Beelzebub’s doing and the Aldi car park is basically a no-go area at any time of day. Just don’t bother. 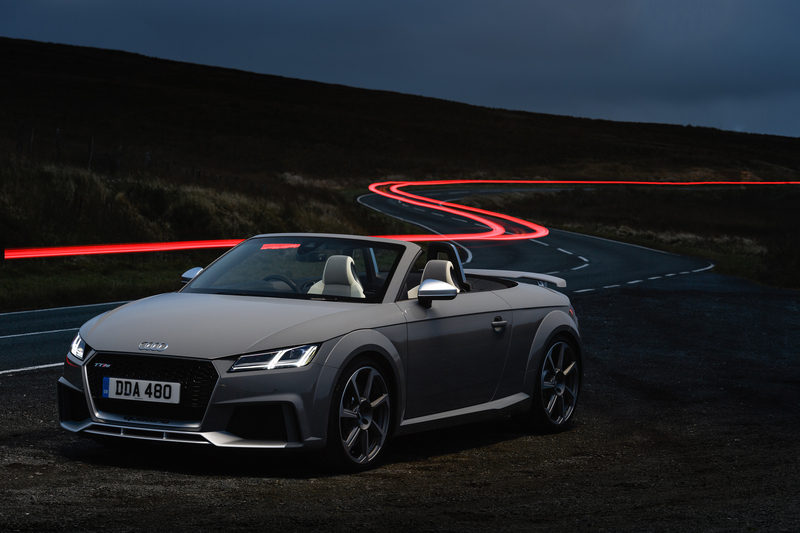 But take a look at the new Audi TT RS Roadster. It might not boast a screaming V10 engine (it has a 2.5-litre, five-cylinder turbocharged petrol motor) but it packs the sort of performance body blow that will leave any petrolhead panting. The 0-62mph sprint is taken care of in 3.9-seconds, the top speed is limited to 155mph and its peak power of 400ps is delivered between 5,850-7,000 rpm. And then there’s the noise. It’s pure theatre. Depress a button on the centre console that drops the three-layered fabric acoustic hood, thumb the little exhaust button, toggle the TT RS Roadster into ‘Dynamic’ mode and be prepared to receive death threats from sleepy village dwellers. The soundtrack is beyond brutal. It burbles and crackles and pops on the overrun and with every upward gearshift via the steering wheel-mounted paddles, there’s a guttural blast from the rear pipes that makes horses and pet Spaniels go berserk. Straight-line performance is equally as shocking, with the handsome machine gathering pace from the moment the right foot is planted. This is thanks to Audi’s excellent quattro all-wheel-drive system but also the distinct lack of turbo lag. This immense amount of traction is also felt through the corners, where the chassis remains planted and poised, leaving the phenomenal levels of power and grip to spool up and catapult drivers out of bends. Its natural rival for many in this market will be the new Porsche Boxster, but it’s tough to truly compare the two. 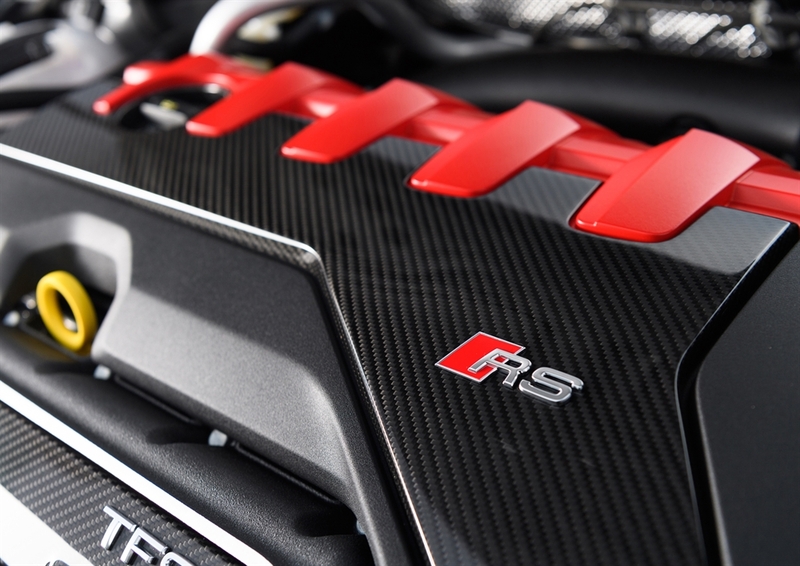 Where the Porsche is all about balance, composure and fine adjustments, the TT RS Roadster is an utter brute – a sledgehammer to the Porsche’s hand chisel, if you will. That doesn’t mean it isn’t fun, though. This thing is small enough to thread through the tightest country lanes, yet offers bags of power to make passing slower traffic a breeze and plenty of grip to keep commitment levels high. Simply point towards the horizon and put the hammer down. 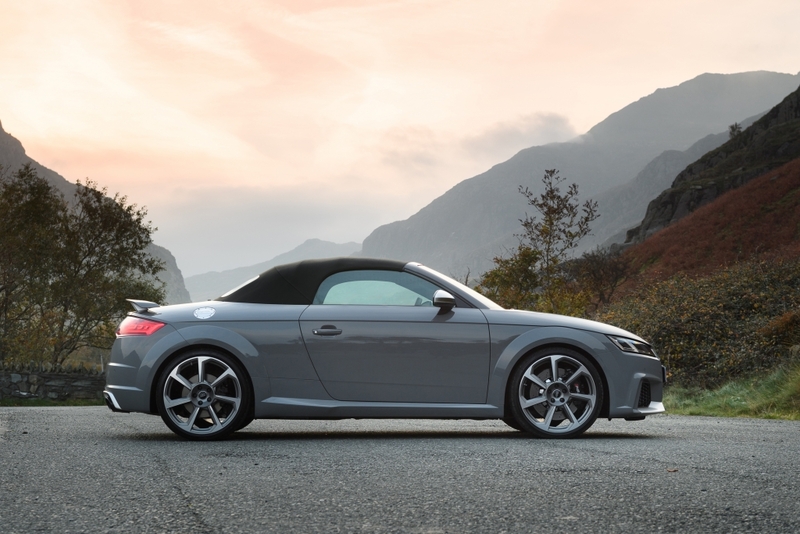 Ok, we’ll admit the two-seater TT RS Roadster isn’t exactly practical, but there is a small boot for weekend bags and a few stowage compartments within the cabin but it comes festooned with every piece of Audi gadgetry you can imagine. The Virtual Cockpit system, which was first showcased on the R8, sits proudly where boring old analogue instrument binnacles once rested, there’s high-definition mapping and navigation, phone-pairing, DAB radio and plenty of other online services. It is also fairly refined when the fun stops and it is time to raise the fabric hood for some motorway miles. 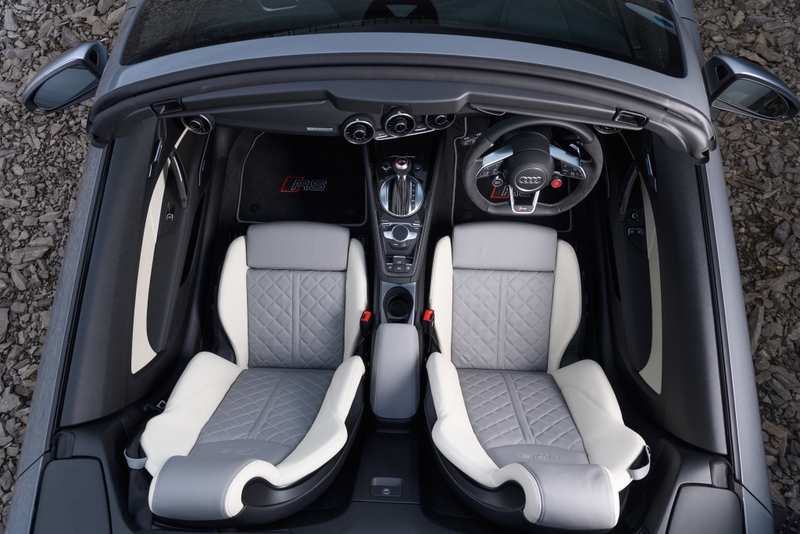 The suspension is plaint in ‘Comfort’ mode, the seats plush and supportive, while the sound system does a good job of drowning out the exhaust note if needs be. At £53,550 for the most basic, ‘options-box-left-un-ticked’ version, it might have some running for the hills but that represents excellent value for money in our book. 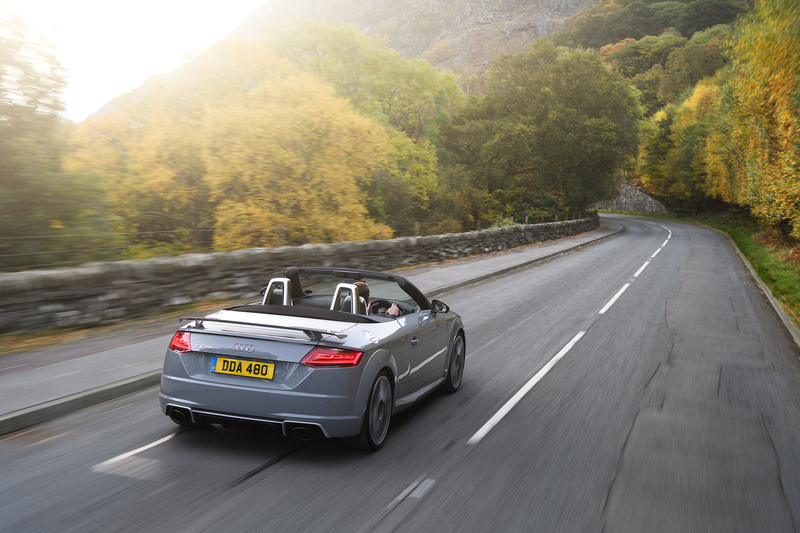 It’s over half the price of an Audi R8 Spyder but every bit as fun. And arguably even easier to live with everyday.